One of the most isolated, longest surviving, and brutal dictatorship the world has ever known is at it again. North Korea recently put out a very disturbing video that showed a nuclear bomb hitting New York City and the subsequent aftermath. The propaganda film depicts what the world might look like if the United States were no longer a part of it. For a country whose rulers supposedly hate everything about America they sure seem to admire American culture which I will revisit later on in this article. The video’s background music was set to the 1985 hit song “We Are The World” sung by a collection of popular American singers including the King of Pop himself, the late Michael Jackson. It is ironic that in a country where hundreds of thousands of people die every year from starvation and poor nutrition the North Korean government chose a song about the United States feeding starving people in Africa? According to a 2012 report on human rights from Freedom House, North Korea had the dubious honor of being the world’s number one offender in regards to human rights. The destitute people of North Korea have virtually no rights at all. There is no justice system, no appeals process, no political opposition, no freedom of expression, no dissenting voices, and no freedom of the press. Many brutal dictators throughout history have controlled their people; but very few have been as effective as the North Korean’s are at controlling their people’s thoughts too. Every single bit of news and information is controlled by the government. The people are fed story after story about how great their government is and how loving and caring they act towards their fellow citizens. The propagandists in the state controlled media tell stories that depict their leader as a magical and mystical person. There are the stories of how the late Dear Leader Kim Jong Il once shot 4 holes in one while playing golf, or how the Dear Leader had the ability to change the weather just by changing his mood. The North Korean people walk around in a catatonic zombie like state in which everything they do and say revolves around the Great Successor. In fact, you could be executed in North Korea for not prepositioning the phrase, “Our Great Successor before speaking to an official of the North Korean Government. Everything inside the capitol city of Pyongyang is a facade. The city itself is very beautiful. It has big buildings and beautiful skyscrapers. The streets are impeccably clean and nothing is out of place. However there is one problem. Most of buildings are all empty. They were built to impress foreign dignitaries and fool others into thinking that Pyongyang is a vibrant city. It is far from it. When darkness falls, the city and the rest of the country is pitch black. The only lights that can be seen from satellite images are mostly from the very select few who live in luxury and work for the government. North Korea is a totalitarian dictatorship. It can also be described as an absolute monarchy or a hereditary dictatorship. It is ruled by the Kim family. The Kim family is a ruthless, barbaric lot. They have tortured, mutilated, and murdered millions of North Koreans. They have imprisoned hundreds of thousands of their citizens in internment camps and starved to death an estimated 3.5 million more in the Great Famine from 1994 to 1998. For more on life inside a North Korean prison camp read The Aquariums of Pyongyang by Kang Chol-Hwan if you have the stomach. The first Kim to rule North Korea was Kim Il Sung. He ruled from 1948 until his death in 1994. There are over 400 statues of Kim Il Sung all over North Korea. There are many buildings, a few schools, a library, and a town square named in his honor. He is the most revered figure in North Korea to this day. He is known as “The Great Leader” or “The Eternal Leader” to the North Korean people. After the death of Kim Il Sung in 1994, his son Kim Jong Il took over as “The Dear Leader.” He was just as brutal, barbaric, and eccentric as his father. Like his father he was also afraid of flying and traveled everywhere by armored trains. Kim Jong Il loved everything about the American culture except America. He loved our movies, he loved our food, and he loved our sports. His favorite movie was said to be Rambo, his favorite food was said to be lobsters, and the 5 foot 2 potbellied dictator’s favorite sport was basketball. He loved lobsters so much that he had live ones air-lifted into the country on a daily basis. Imagine that, in a country where more than three quarters of the population are starving to death the “Dear Leader” is eating fresh lobster, watching Rambo and cheering for his favorite NBA team. 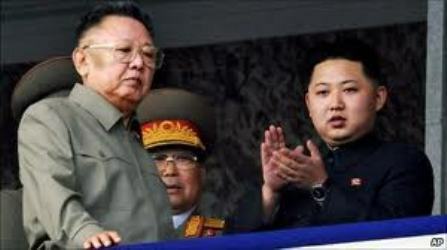 Kim Jong Il died on December 17, 2011. His youngest son, Kim Jong Un is now the ruler of North Korea. The “Great Successor” as he is known by is reportedly only 30 years old. He is reported to be the youngest Head of State in the world. Not much is known about the youngest son other than his striking resemblance to his grandfather, Kim Il Sung. It has been reported that Kim Jong Un was educated in Switzerland and may even speak English. Like his father, he is also known to be a huge basketball fan. It is reported he smokes cigarettes, drinks Johnny Walker whiskey, and drives a Mercedes Benz. It is not known whether or not young Kim will rule exactly like his father and grandfather before him but if history is any indication chances are he will. There have been reports that because Kim Jong Un has spent time living abroad he has been exposed to different cultures outside of North Korea. It is possible that some of what he learned could influence how he will rule. However the reality is he is surrounded by relatives of the Kim family who want things to remain the same. The North Korean military style government continues to stick their thumb in the eye of the International Community. They have broken numerous agreements with the United States in regards to their nuclear program. They have conducted numerous missile launches over the years and show no signs of stopping. In fact, it has been reported that they are getting ready to launch yet another missile in the very near future. North Korea is a puppet regime. Their threats are empty and their rhetoric is as weak as their leader; a school boy whose only military experience was probably shooting down an airplane in a video game. They are the equivalent of having an army of soldiers that carry empty guns. They are: like a small dog with a loud bark, harmless and annoying. If they ever tried to attack the United States they would never be successful. They barely have enough resources to equip their military let alone launch a successful missile attack. With that being said it may be possible to thwart their aggression towards us by possibly eliminating their perceived threat. The Korean War started but technically has never officially ended. It started on June 25th 1950 and it ceased on July 27th 1953 with a signed armistice agreement. After 60 years the United States and North Korea have never actually signed a peace treaty to end the Korean War. What if we were to offer an olive branch to the North Korean government? What if we were to kill them with kindness? You may be reading this and thinking is this guy turning into the modern day version of Neville Chamberlain? The North Korean people are starving. Even the select privileged few are worse off due to international sanctions, long term droughts, and not enough food. In fact, the only time the North Korean government complies with the International Community is when they need assistance. That is when they sign some agreement they have no intention of keeping in return for food and supplies. We could offer the North Koreans a conditional peace treaty along with a food for human rights assistance program. The Neutral Nations Supervisory Commission has been monitoring the DMZ for years. There is no reason they couldn’t also monitor for human rights violations too. We could offer the North Koreans our assistance in exchange for verifiable improvements in human rights and the complete dismantling of their nuclear weapons program. By potentially eliminating one nuclear threat it would allow us to focus our attention on the more dangerous threat in Iran. Additionally, it may also bring much needed stability to the Asian Peninsula while simultaneously securing the backing of the International Community. If the North Koreans should breach any portion of this new peace treaty it should be considered an act of war. They need to know that the United States could be an ally or an adversary depending on their actions. I believe the only way you can secure peace is through superior strength. You can not be weak in the face of evil. Some on the left might think my suggestion is nothing more than cowboy politics. They may be right. It is no secret that the American people are tired of fighting and supporting foreign wars, I get that. But in the end our country will be safer if we show strength rather than weakness in the eyes of our enemies.